We will wind our way through the houses in Les Esglésies to take the old path towards the outskirts of Sentís and the village itself. From here we will ascend towards Prat d’Hort, going around its hill and beginning the descent on the track until we come to the N-260. We will pass Perves hill and follow stretches of the old path towards Corroncui. 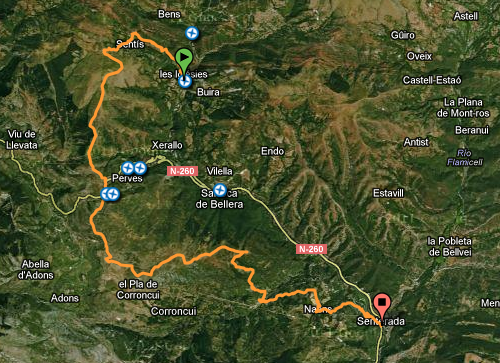 Before getting to the village, we will take the track that leads to El Pla d’Amunt and the Comillini mountain range. A considerable climb that will be worthwhile when, past a small wood, we will discover the Haunted House and its magnificent views. We will make a steep descent to the village of Cadolla from where we will continue on the old path towards Naens to get to Senterada. Points of passage: les Esglésies – el raval de Sentís – Sentís – Prat d’Hort – serra de Comillini – la Casa Encantada – Cadolla – Naens – Senterada.